About The Consortium | Find classes to meet your career and academic goals! 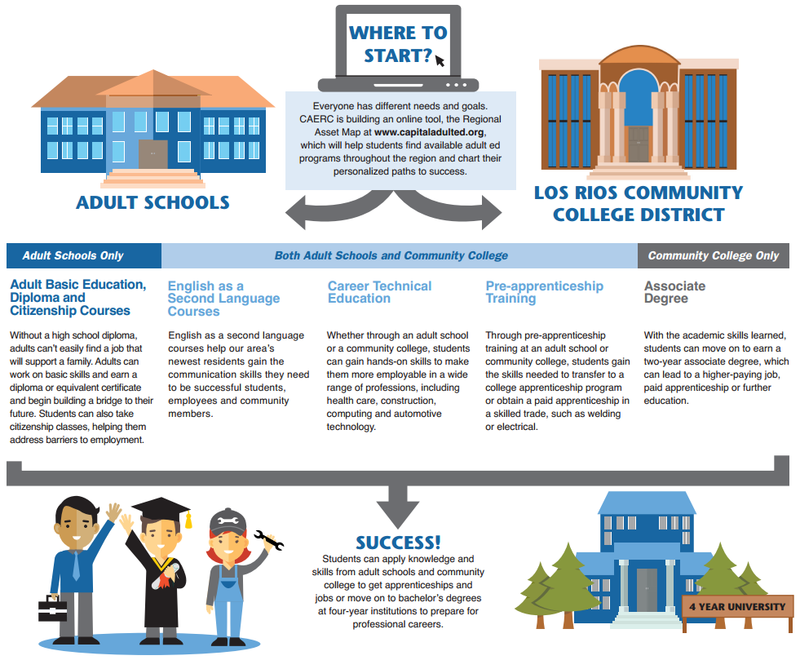 The Capital Adult Education Regional Consortium (CAERC) is comprised of 14 members and 22 partners from throughout the Los Rios Community College District geographical boundary. Members include large and small school districts, county offices of education, and representatives from all four of the Los Rios colleges. CAERC partners include other adult education stakeholders from throughout the region. With Assembly Bill 86 funds, CAERC Members and Partners collaborated to identify the adult education needs and developed CAERC's AB 86 Comprehensive Regional Plan (March 2015). In June 2015, Governor Brown signed Assembly Bill 104, which set aside a $500 million Adult Education Block Grant for the purpose of implementing the regional adult education plans throughout the state. Learn more about CAERC at www.caerc.org . A Pathway Tool for Students! To help adults find the classes they need to reach their academic and career goals, CAERC created www.capitaladulted.org so that you can plan your path to success! If you have further questions or comments, please don't hesitate to contact us.